Comments: Soft cover, italian size 19,2 by 27 cm, printed cover with an acetate jacket and obi. Mixted matte and glossy paper. Divided into alphabetical sections, Shunji Dodo’s _Horizon Far and Away _is a visual collection of memories revisited through the existing photographs from his archives. 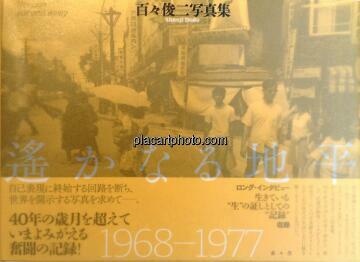 Capturing events such as the students protest at Tokyo University in 1969 to personal moments shared with his wife Setsuko and the birth of his first born son in 1974 the images within serve as both archive and memoir into the years of 1968-1977, a world in which was lived and photographed by Dodo reflecting his photographic journey from a young adult and the many social upturns and changes which would symbolize the era of post-war Japan. Included within is an interview conducted by Suzuki Hiroshi entitled ‘An interview on “memories” as proof of the life I live.’ available text only in Japanese along with a Postscript by Shunji Dodo available text in English.